Decision making is the first step in all organizing projects. And when those decisions become overwhelming is when we become paralyzed. For ADHD and executive function challenges, decision making can halt organizing progress. 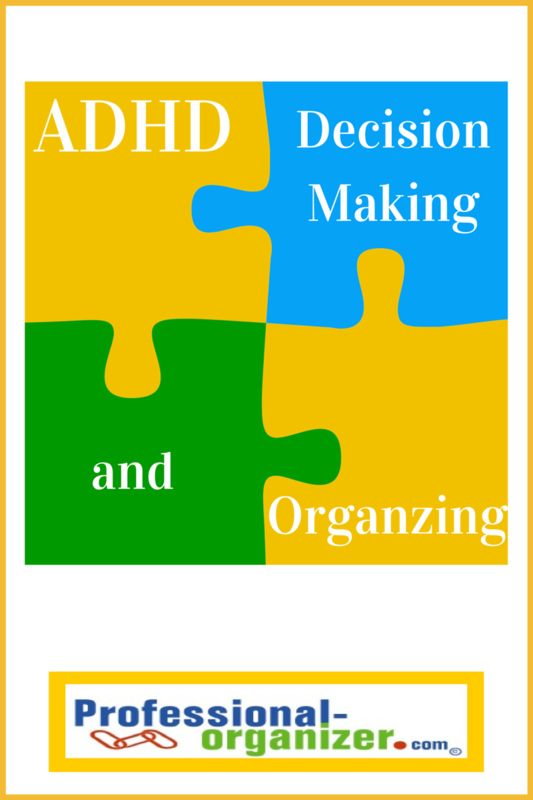 There’s a definite connection between ADHD, decision making and organizing. It’s overwhelming to think about the number of decisions we make in a day. Research reveals that when we make decision after decision, we become frustrated, angry or anxious. Each day we are make decisions about literally thousands of questions or crossroads. When it comes to decision making, think about limiting choices. Keep it simple like just 3 -5 options, rather than ten or more. When you begin organizing, make decision making simple and easy. Start with decisions to let go of things that are easy to part with, you have not used or seen in a long time, or without hesitation know your decision. When it comes to the stuff in your life, one question can be all you need. Make decision making easy with one big question to answer: does this make me look or feel fabulous? If the answer is no, off it goes. Use the tournament method. Compare two items, pick the best. Use the “winner” and compare with another item, pick the best. You can divide items into four piles and use the tournament method too. It’s not surprising how much rest and nutrition play a role in good decision making. Research shows that a good night’s sleep makes for better decision making, improved retention of information and a better outcome. Get 7 to 8 hours of sleep each night. Not only will you feel better on all fronts, it’s easy to make decisions and be productive. Start with an earlier than expected prep time for bedtime. It’s easy to get in bed when you are ready. Hydrate throughout the day. Our brains are need water. Keep protein handy. We can’t make good decisions with just snacks. Eating protein regularly helps us think clearly. We know we don’t know it all. But that’s not a problem! We have trust resources to help make decisions. Our resources include an array of options, including our friends, professionals and the internet. Build competence and confidence with your resources. Start with your easiest way of finding information. Phone or text a friend or look online are the simplest first steps. Reading a book or blog can help you find the information you need. Add in a clutter buddy or paper partner. They are your trusted friend for decision making; your go to resource for no matter what the question is. Decide on what’s easiest for you. Take the emotion out of your decision. Think about the decision as if you were making it for someone else. Take a deep breath, do 10 jumping jacks, call a friend and share why this is so hard. Ask yourself what’s the worst thing that can happen if this decision is not right. Then get back to that decision. It’s often not the decision at all that is hard but an emotion associated with it. Ask for help. It’s hard to accept ask for or accept help. But a partnership can make all the difference. Ask for help when you find yourself lacking a skill, not sure of how to manage technology or to speed the project along. Remember that in doubling up with a partner you have more brain and brawn to find solutions. We all get stuck sometime. Find ways to help yourself with decision making whether it’s paring down, wellness, or resources to make decisions happen. More resources on my ADD/ADHD pinterest board. 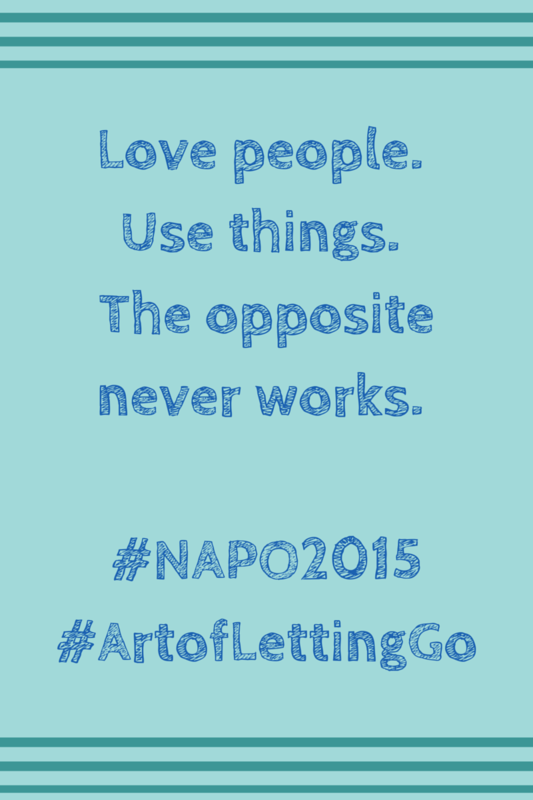 Our industry gathers each year for our NAPO (National Association of Professional Organizers) conference. It’s our annual family reunion where we learn and hug! This year we were privileged to hear The Minimalists. Joshua Fields Millburn & Ryan Nicodemus write a blog about living a meaningful life with less stuff (for 4 million readers.) They shared their powerful stories of transition to simplicity. They shared some powerful stuff. Josh and Ryan are best friends from way back. Both chose a new path to having less and experiencing more because of transitions in their lives. Originally living more traditional lives, they chose to let go of what is meaningless to them. It required them facing situations that were emotion charged losses. It made me think about how a sad and difficult situations can create the opportunity for change. The Art of Letting go comes from the perspective of our new assessment of what our stuff means to us. Our stuff does not define us. Our memories are within us, not in our stuff. We can share our stuff with others who will find it useful. We can remember without the stuff. It all came down to this question about our stuff. The question they asked of us…how might your life be better if you owned fewer material possessions? Are you ready to embrace a life that means more without your stuff holding you back? Are you ready to simplify your life? The Minimalists offer their solution to get started called #MinsGame. You eliminate one thing on the first day of the month. On the second, eliminate two things. Three items on the third. It’s contagious! And who doesn’t like to play when you are an automatic winner? I love the baby steps here. Not only do you feel the emotional lift of less in your space, #MinsGame offers a daily dose of paring down in a small way. It can be anything in your space that you choose to eliminate. I love that decluttering takes on a powerful reason. It shifts your focus from holding on tight to what you have just in case to keeping only what is most meaningful and useful. Your decluttering and letting go will give you more opportunity to live the life you have imagined. The Minimalists resonated with me because of this quote they shared. Love People. Use Things. The opposite never works. It’s in the art of letting go that we find what is being camouflaged by stuff and see what’s important to us. That’s what’s empowering about organizing and simplicity. Isn’t that what we are truly want? Hugs and Happy Organizing posts are about client successes. 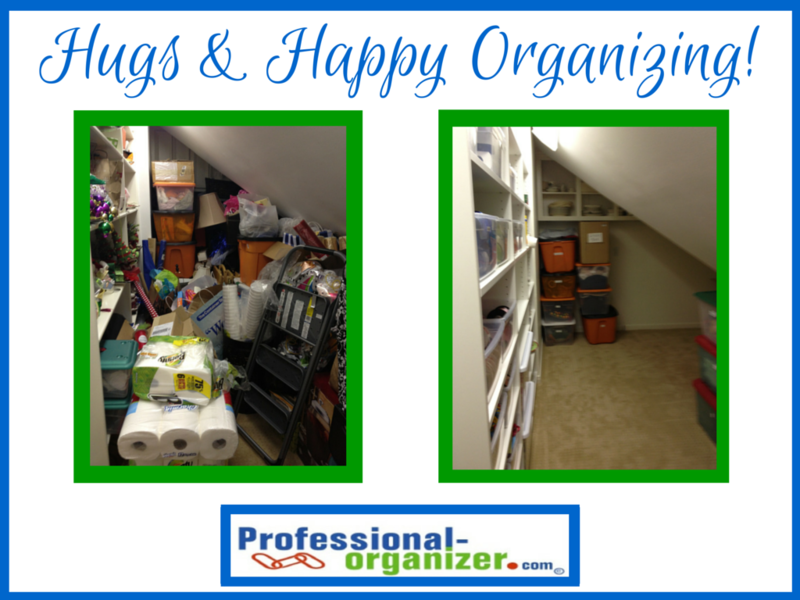 Here you will find a happy organizing story about storage. We all want more storage! Having an extra closet makes all the difference! Be sure to keep your floor clear. When your floor is cluttered, storage space becomes chaotic. Review what you are storing annually. Be sure to decluttered what is past it’s prime or unused. A great shelving installation makes all the difference. Inexpensive or custom, shelving heights should make it easy to store items. Color coded, labelled bins make it easy to retrieve seasonal storage. More posts on Hugs and Happy Organizing here. 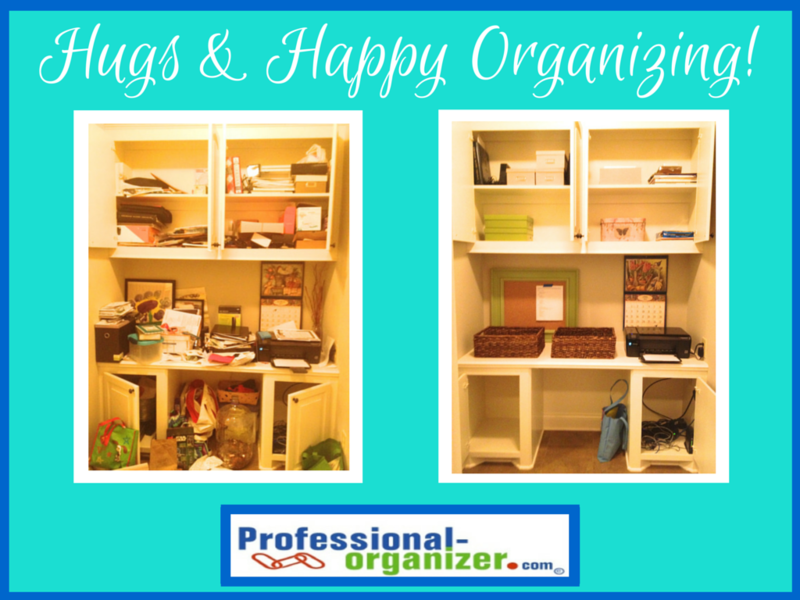 Monthly doses of happy organizing ideas. Join my newsletter! Suddenly the roles are reversed for you and your parents. They need your help with their mail, paper work and medical care. It can be a difficult and emotional time too as you as your family find new ways to support each other. 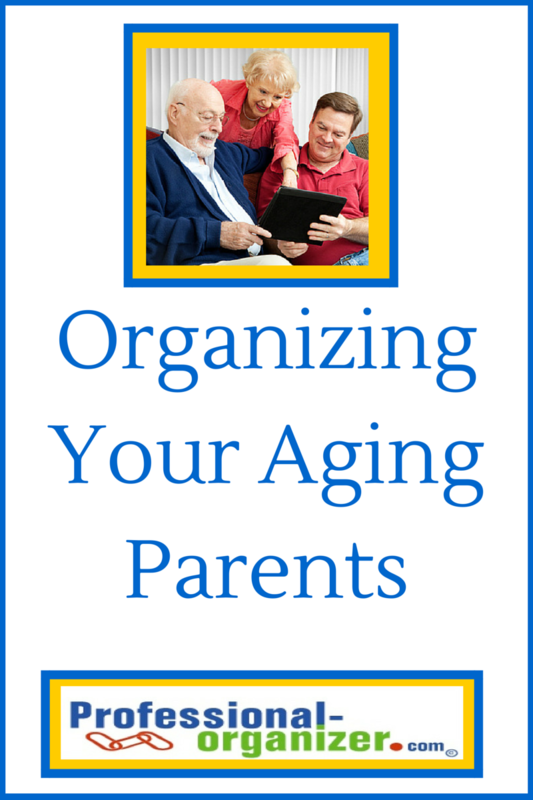 Your aging parents need your patience, help and support in ways you may not have imagined. As with all transitions, having a family meeting is a great first step. Learn from your parents what is most difficult for them. Learn their wishes on how to get started transitioning what must be done. If possible, sit with them while you get started on the tasks. Their input shows your respect for them. They may be resistant to ask for or use your help or those around them. Start with small steps and work together. Start with their important papers. Just like for your own family, you want to keep a copy too of your parents’ papers. Your parents will need a durable power of attorney if you want to help them with financial decisions. A living will helps them share their wishes for medical treatment. A first step for meeting your parents medical needs is a list of doctors and prescriptions. You will also need their medicare, secondary benefits and prescription benefits numbers as well. A complete medical history will help when emergencies arise. Once you type these lists, you can print them, save them to Evernote or Dropbox, or take a picture of this list with your smart phone. It’s best to have these with you at all times. One of my clients created lists that included the pictures of each doctor. It was easy for all family to take his parents to see the doctor and recognize that person. You may want to ask your parents if they would like help with bill paying and money matters. You can be added to their checking account to be able to pay bills online for them. Be sure to have a record of all account numbers, banks, and financial advisors just in case these are needed later. Not always thought of, but very important, are passwords and other account access information. You can help them by creating a password book using an address book. That way all the passwords are kept together for them. A list including their insurance information, credit card accounts and other account numbers helps you when you need to contact vendors. Your list should include a contact number and website. Getting started may be the hardest part. Here are some resources to review. How do you eat an elephant? …….One bite at a time! 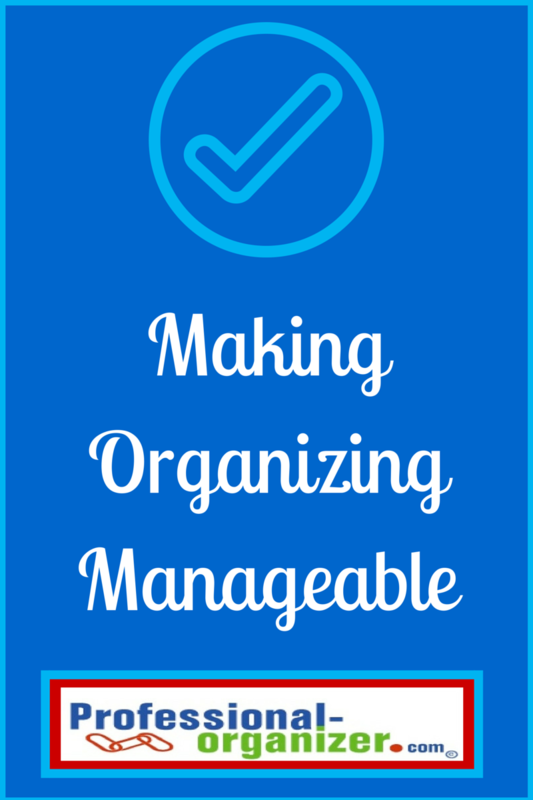 Making organizing manageable is all about breaking the tasks into manageable pieces. When we see a big project it’s often overwhelming. We think about organizing our entire home, storage or an office and it seems to be an impossible tasks. There are several ways to chunk down the project and create a manageable plan. I am a huge fan of using a timer to work on any project. Even just 15 minutes on any project will help you reach your goal. But I also like the idea of percolation time and working an hour at a time. Other ways to use time increments include two or three hour segments with an alarm set for 30 minutes before the end of the time. If you are unsure about how long the project will take, using time increments helps you get started and work in measured units. Think about dividing the space you are working in into quadrants of work. It could be floor space, left wall, center wall, and right wall. It could be dividing the space into 4 quadrants entirely. Creating a physical delineation of what areas you are working on helps you see change. There’s hoola hoop organizing. Drop a hoola hoop on the floor and work on that area to eliminate and organize. As more space evolves, you are feeling more capable and less overwhelmed. Flylady refers to her 27 fling bogie. Flylady suggests eliminating 27 items a day. White House Black Shutters recommends 40 bags in 40 days. Use numbers to help you break through your feeling of being overwhelmed. You can choose your own number, no matter how large or small. Whatever your numbers, use these wisely to make your project easy to accomplish. It’s much easier to work together to achieve more. Make organizing manageable by adding a partner or triad of workers. Not only does having many hands help, you have lots of ideas to get your organizing done. Whatever strategy you use, make organizing manageable in a way that fits your strengths and style. Choose one of these ideas in order to get started and complete a project. Monthly organizing tips and tweaks. Join here! Is it not in your nature to ask for help? Have you asked for help and you heard crickets? Is it easier to procrastinate about something rather than ask for help? Let’s admit it, asking for help is hard. It may seem like it’s a signal about deficiency or weakness. It may be about fear and vulnerability. It may be a lack of a skill or an undeveloped skill. It could even be about being stubborn. A lot plays into asking for help. It’s time to acknowledge we are all not good at everything and play to our strengths. It’s the best way to conquer a tough project though. It helps you move forward when you are stuck. It saves you time when you are struggling with a task or technology. Bringing together more hands and ideas can improve your project too. 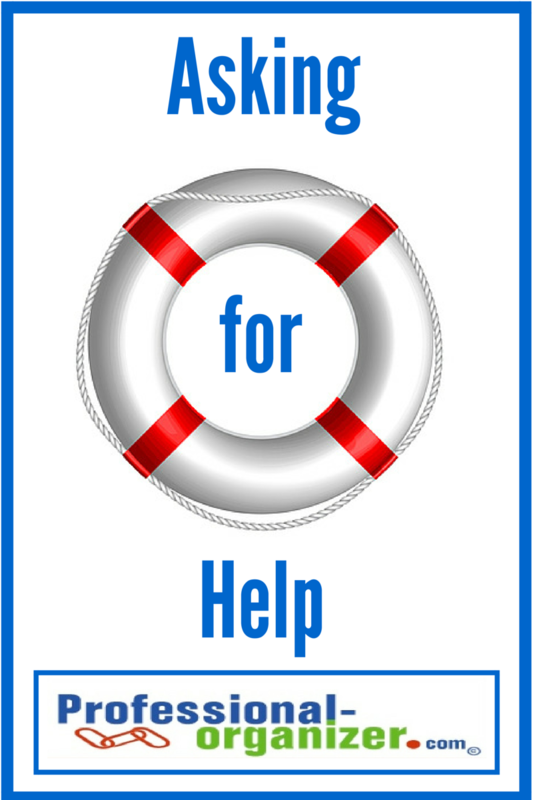 Is it time for you to assess asking for help? The best way to start anything new is to start small. Ask for help with a small time commitment or piece of the project. Isolate just one thing that is holding you back on a project. Ask a trusted resource to help you with that one small task. If you are not sure what that one small thing is, ask a trusted resource to process the steps in the project to create the series of actions for completing the task. Collaboration is a great strategy for asking for help at work. Create a team that works well together who create energy and more together. Find resources for a variety of needs that you have, whether tech, writing, calculations or other needs. Sweeten the pot with an offer to assist with a strength you have. Email is your best tool for asking for help. Be sure to include a specific request with a deadline. Think of potential solutions as options that your resource can help you with, especially the small simple solutions. Think about additional resources like coaches, professional organizers, and productivity consultants who can also provide support and increase your productivity. We often think our family is an unreliable source for help. However, asking for help at home is an important part of family cohesiveness. Even if you think it’s easier to do whatever yourself, teaching how to help others and team work is worth the extra energy and time. It’s easiest to ask by starting with a family meeting. Even if there is a lot of eye rolling, your family will be happy to help with simple, small tasks that can be done quickly. Use a family chart to keep everyone on track. Set a time and date for your helpers to complete their work. If someone is already doing that task, count that. Find tasks everyone can do at the same time together to get a big job done too. Have an array of resources at your disposal. My first go to is google and find online resources. Finding answers can be as simple as a few keyboard clicks. It takes a few minutes and already I know new tricks. My next step is to find someone in my inner circle who can respect my request. There are many colleagues, family and friends who have skills that compliment mine. I return the favor by offering something to help them as well. Finding resources in your community are a great collaboration as well. In my arena I love having interior decorators who work on color and space design, handymen who repair and hang pictures, and tech people who help make my computer and smart phone work well. Who would be a bonus to you as a resource? Not matter the challenge, there is help there for the asking! Remember to share your gratitude for their help. It’s not only about how to ask for help, it’s also how to appreciate those helping out too. Tricks and tips for any organizing or productivity challenge here!